In nearly fifteen years in international financial services, Farah worked on business strategy and led business development and cost efficiency projects involving high complexity across several countries. She is skilled at relationship management and thought leadership, and is committed to continuous improvement principles in business operations. 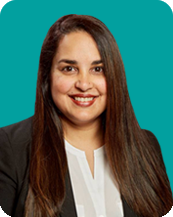 Farah has an MBA from the Richard Ivey School of Business at Western University, Six Sigma Green Belt designation, and is a certified Project Management Professional (PMP). Outside of work, Farah loves spending time with her family, and is also involved in the local community as a member of the Board of Directors of the Learning Disabilities Association of Halton.